A lengthy press conference this morning, Thursday, at Le Mans gave us a chance to hear many more details (and a few more tantalizing hints) of the Peugeot LMP1 programme first announced here last year. 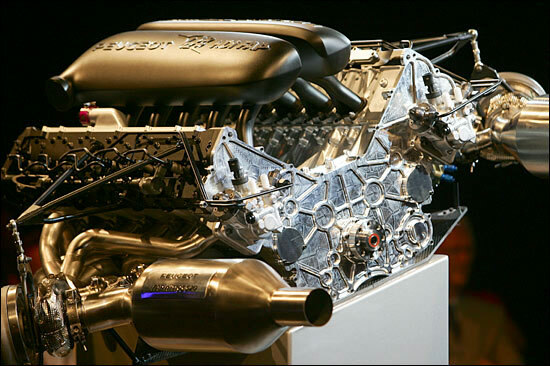 The conference was called to unveil the 5.5 litre twin turbo V12 that will power a pair of Peugeot 908s at the 2007 Le Mans 24 hours. 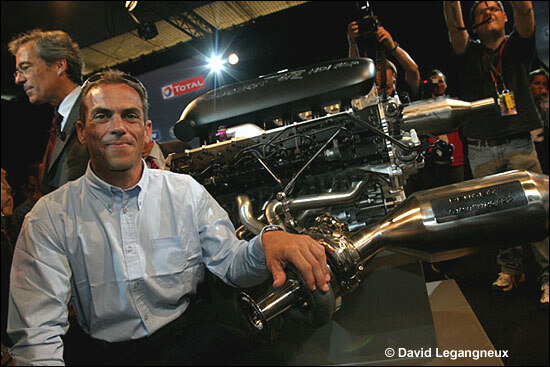 The engine is a 100 degree V12 twin turbo with a pair of Peugeot particulate filters. The initial performance figures are very impressive, with more than 700 bhp and more than 1200 Nm of torque. The 100 degree V-angle has been chosen to allow “the centre of gravity of the engine to be kept as low as possible, without affecting the torsional rigidity of the package”. The diesel route was a logical one for Peugeot to take. Its worldwide sales are now dominated by diesels with 60% of the company’s total sales now featuring its HDi engines (70% in France). There was much play on the fact that the core elements of the engine programme (Peugeot HDi technology and the inclusion of particulate filters) began in the company’s road cars before evolving into the race cars: the opposite is usually true of factory race programmes. There may be a further significant decision to come in the next few weeks, with a very active consideration being given to using bio diesel for the programme. Total Fuels, Bosch and Michelin will be the principal technical partners for the programme. 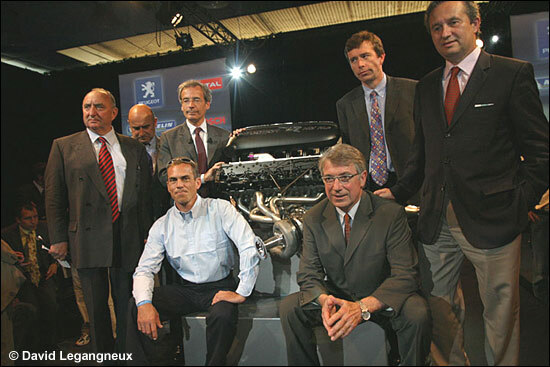 There was further confirmation, from the Director of Peugeot Sport Jean-Pierre Nicolas (on the left, below), that a full scale mock-up of the car will be presented at the Paris Motor Show in September, ahead of a first track test in late 2006, Eric Helary having already been named as the designated test driver for the initial programme (Helary of course having been part of the 1993 winning driver squad aboard the Peugeot 905). Peugeot has made it clear that its initial ambitions are relatively modest, drawing comparisons with the initial programme in the early 1990s with the Group C Peugeot 905. Could an entry at Sebring be part of that early programme? There is a subtle but significant change in the soundbites being employed by Peugeot this year. The initial announcement of the programme last year included the mission statement that “Peugeot want to be the first to win Le Mans with a diesel-powered car.” The mission now is clearly rather more centred around beating Audi, and perhaps hoping that the Ingolstadt steamroller stumbles for the next two races. It was made explicitly clear though that Peugeot does not envisage this as simply a two year project, the clear indication being that the company intends this to be the principal motorsport programme for several years to come, after their recent withdrawal from the World Rally Championship. A factory effort in the Le Mans Series looks certain for 2008 with a partial 2007 programme looking likely too, but aside from Sebring it seems that the ALMS is unlikely to be graced by the 908. There was talk of a working list of 14 drivers with a shortlist of 6 or 7 under consideration for inclusion in the squad. After the exploits of Sebastien Loeb here over the last two years there was an almost inevitable question over the potential for Peugeot’s rallying hero to join the team. “Marcus (Gronholm) is not at all interested in this form of racing.” That’s that settled then! One other famous name was mentioned – Is there any role envisaged for Henri Pescarolo in the programme? A degree of further probing though revealed the potential for Pescarolo to potentially adopt a team management role akin to that which Jean Todt adopted with the 905 project. The price though would be that his own team would have to cease sportscar racing operations: depending on the result of this weekend’s endeavours, that might be an easier choice to make for Henri.